Think embroidered cushions and something pastel, a little frilly and slightly twee springs to mind – not really my cup of tea. Textile designer Chloë Owens changes all that with her bright, elaborate personalised designs. Using a mixture of fabrics, felt, threads and buttons, London-based Owens’ birds, butterflies and flowers are unique. Appliqués in vintage fabrics, small felt flowers, ladybird buttons, stitched drawings and machine embroidery combine to create rich, unique pieces. There’s lots to look at in the Chloë Owens store, from soft toys (specialising in bunnies and owls) to books and tea cosies but it is the commissioned cushions that I think are really striking. Perhaps it is because I entertained the thought (for a nanosecond) of making some kind of quilt or other such thing for my children when they were born. Thankfully sense prevailed and I have left that kind of thing to the experts. A cushion commemorating a baby’s birthday would be a very special gift. 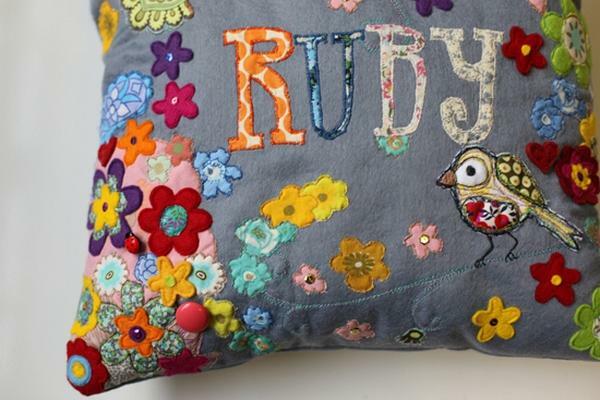 Customised cushions are priced on application. Other Chloë Owens pieces range from £15 for the soft toys to £35 for appliqué cushions.